Standard Edition Black Vinyl ! 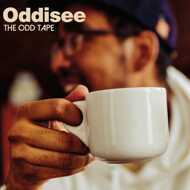 After his 2015 breakout album sophomore solo album “The Good Fight” Oddisee is back with an instrumental gem that shows his growth as an artist that has led more than he has followed. Originality is king with Oddisee, and this new album shows that his creativity is unlike any other, collecting influences from across the world. The New album entitled “The Odd Tape”, is a perfect thinking man’s companion album for cold mornings and warm coffee with a surprising amount of depth. Oddisee has created his own distinct sound in hiphop through the years. Seeing himself as an artist above all. Oddisee has blended influences from 70s soul to modern sampling. Most fans will recognise his signature approach to double time drums and sweeping synths immediately.